It can’t all be work and no fun at the hospital! We have had several volunteers stop by to see if we need anything. Often times they have great stuff for kids to play with, but mostly older kids. We have had clowns, football players and even dogs stop by for a visit. They are very kind and usually speak to us for a minute and then move on to the next kid who might be a little older and their entertainment is probably a little more fitting. This morning a young volunteer knocked on the door and asked if she could play with Sutton. She came in carrying a baby toy probably for a child a few months older than Sutton. She began to explain that she had searched through everything they had with Sutton in mind in order to find the best toy they had for her age. She had gone out of her way just to spend some time with Sutton, much more than just a hello. We spoke while she was here and she is a student who volunteers to be around children. She has applied to nursing school and is waiting on her acceptance. She already has the heart of these pediatric nusrses that is so special. She stayed for about 20 minutes and even let me sneak away to get a cup of coffee. She was so engaged and showed such ginuine care for spending the time here. She will go far and I have no doubt that she is in the right place. Hopefully one day, if we ever have to return, we will see her here as a nurse. As for Sutton, we are making some progress. She has had her Ph probe in for 22 hours and 54 minutes, but who is counting. It is an small computer attached to a probe inside her throat. She has done well with it and we have been very dilligent at pressing one of nine buttons at any given moment over the past 24 hours. Hopefully we will see the results quickly and start working on our exit strategy. Several Pulmonologists, and ENT, and a GI doctor walk into a bar….well a conference room anyway. They discussed the wheezing and the other issues with reflux and the overall concern of CF to decide how best to move forward. They have determined that Sutton has Tracheomalacia which is a common issue with infants around her age. It is basically a loose or floppy wind pipe that she will grow out of. It is the cause of the wheezing sound and actually sounds much better today. The reflux can aggrevate it, but she has been on reflux meds for a couple of days now and everything seems to be getting better. They are a little more concerned with all of the issues as they relate to CF so they want to be sure everything is looking great before we move to the next step and return home. My mother was explaining to her mother, my 87 year old grandmother that she had tracheomalacia. My grandmother was concerned and said “They actually gave that poor little baby one of those?” My mother then explained that it wasn’t a tracheostomy. Sometimes the miscommunication over the phone entertains us all. Many of you have offered to help us in so many ways. It means the world to us. We have so many moving pieces right now, we don’t even know where we need help and to top things off, Hiatt is home sick today. Many of you have just jumped in and suprised us and that has been amazing. Sometimes just knowing that people are so caring and generous is enough. We have been blessed with amazing friends and family. We like to think we have this under control, but the truth is that you all have us under control. Thanks again for thinking of us. We love you all and are here if there is ANYTHING we can do (other than pray!). Thank you for your updates, Jeff. 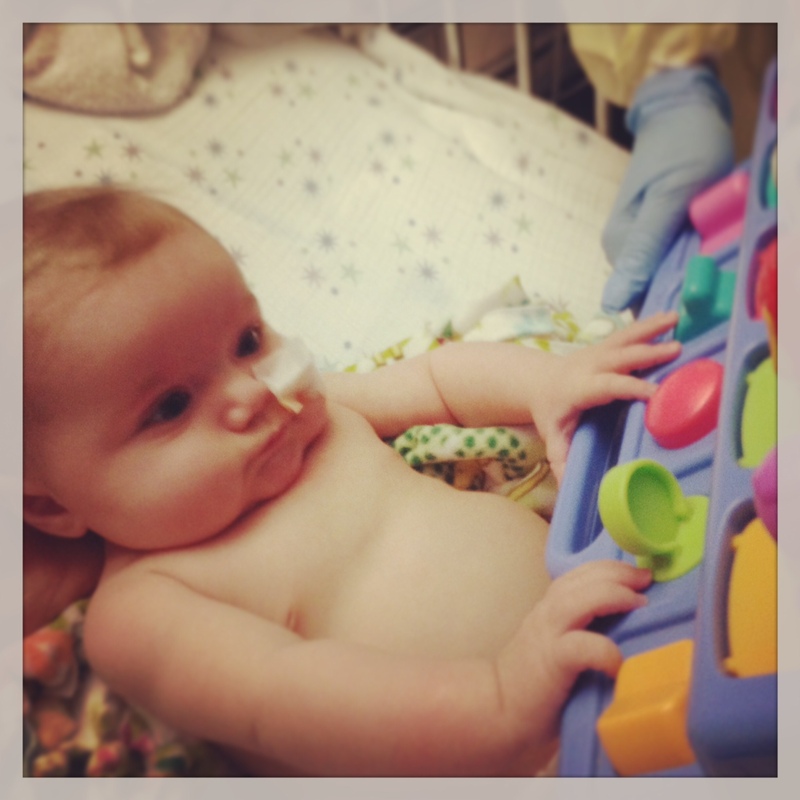 Please give little Suttsy a kiss from Aunt Lynn…she is such a brave and strong little girl. BLESS ALL OF THE CAREGIVERS, THE YOUNG AND OLD EACH AND EVERY ONE. GOD HAS A SPECIAL PLACE IN HIS HEART FOR THOSE WHO GIVE. TO ALL THE FAMILY AND EXTENENDED FAMILY MY LOVE. V.
We are continuing to pray for Sutton. Hate to hear she is still wheezing. Tracheomalacia is finally what they ended up diagnosising Emery with; although now they have now classified it as laryngeotracheomalcia. She had to have a bronchoscope done for the diagnosis but they tell us that is where her wheezes come from as well. She is still on reflux meidciation. The only thing that would stop her wheezing was being placed on vapotherm oxygen treatments. Maybe suggest the vapotherm if they still can’t control Sutton’s wheezing. Paying you all get some relief soon!